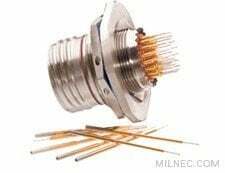 For improved performance we recommend Milnec compatible MIL-DTL-38999 Series I style connectors. To quickly order your 38999 connector prefilled with your preferred PC tail contacts, take your connector part number and replace the P (pin) or S (socket) with X (PC tail pin) or Y (PC tail socket) and simply add the Dash Number of the preferred contact tail length. For example to order a DL07W11-35PN with DLPT22-106 PC tail contacts, order DL07W11-35XN-106.